Synopsis: Mind Salad is the story of Mick Calendar a struggling playwright and screenwriter from south London. 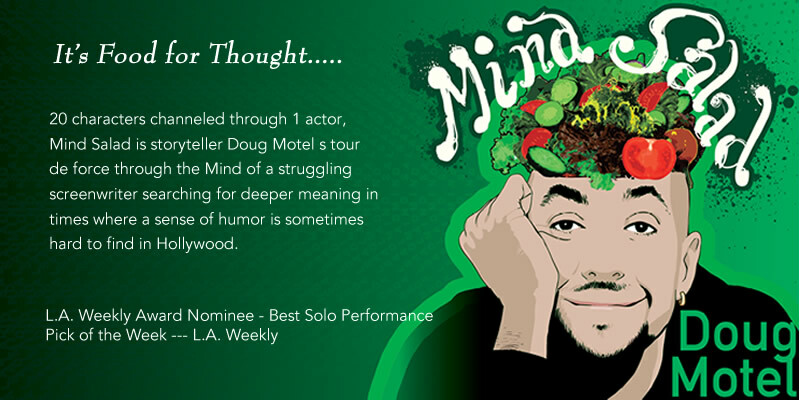 Struck with a bad case of “very loud mind” he decides to move to Hollywood (!) to quiet his chattering Ego (a cross between Jeeves the Butler and Satan)! “Here in America there is a slogan that says “a mind is a terrible thing to waste”, my slogan is “a mind is a terrible thing to HAVE”! Laments Mick. Follow Mick as he relives the hilarious and terrifying journey of a life chasing worldly attachments with the Inner Critic as his tour guide. Twenty characters channeled through one actor. Watch video of Mind Salad. Purchase the script of Mind Salad.